Much anxiety these days among mainstream media journalists about the proliferation of so-called "fake news." The concept has been around for a while, but seemed to gain more traction during the recent US presidential election. 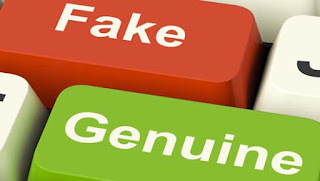 As defined, "fake news" is a deliberate attempt to present false information for the purpose of sowing doubt in the mind of the public about issues and politicians. A serious consequence of "fake news" has caused the public to distrust all media even more than before, and that is a real concern. It is an updated version of "Gresham's Law" which states that "bad money drives out good." Bad media can also drive out good media, it seems. These are times that are truly fraught. While there is no doubt that the internet has allowed for a horrifying view into the murky workings of trolls and other anti-social elements, we are being driven to a dubious conclusion about the causes of "fake news" - in effect we may be overreacting to a phenomenon and deserves scrutiny but not panic. A recent study by the Columbia Journalism Review on "fake news" acknowledges that it exists. But it is very small compared to mainstream media consumption. CJR notes that most disinformation is spread and reposted, largely by one source - Facebook. It also claims that most Americans overwhelmingly rely on mainstream media even as they may dip an occasional and curious toe into the murky pools of the internet. I think some of the panic surrounding it is definitely overblown -- fake news is a problem that has been around for centuries, if not longer. I just wrote about how it was practiced by some of the founders of the American revolution, including John Quincy Adams and Benjamin Franklin: -- and in there I also point out that while Facebook and the social web have exacerbated the spread of fake news, they have also made it easier to debunk. One of the reasons why (in my opinion) the issue is gaining so much traction is in part, because it serves a purpose for mainstream media organizations to distance themselves from their recent failures in covering the US election, as well as the Brexit referendum in the UK. It is easier to blame the internet and the trolls than it is to deal with the limitations of modern media organizations. In both the US and the UK, news organizations made assumptions that proved to be dramatically wrong. In both countries, news organizations contracted out their intellectual and journalistic obligations to pollsters and pundits instead of going out and doing the basic "shoe-leather" reporting. There were still examples of good - even great reporting. But in the end, news organizations now look foolish and unprofessional as they struggle to get ahead of a news agenda that seems to be leaving them behind. A better outcome would have been to acknowledge that just like America's industrial heartland, news organizations have also been hollowed out. Rather than admitting that the years of layoffs, downsizing and digital investments have brought them to this place, it seems they prefer to blame basement bloggers and the foolishness of the voters. This is a brilliant writing and very pleased to find this site. I couldn’t discover to much different information on your blog. I will surely be back again to look at some other important posts that you have in future.